I write historical romance novels, and the time span is 1860 through 1866 for my Impending Love series, which means I include a lot of Civil War history in my stories. Although I have a large collection of books on the Civil War, this summer I journeyed to Harpers Ferry, Antietam, Bull Run, and Gettysburg to take photographs of the locations of some of the major battles. Harpers Ferry had people in period dress to talk about medicine, ambulances, military passes, and other topics. I asked a lot of questions, but I also learned that sometimes the person can give erroneous information or embellish something, so double check any information received by a person in period dress. The scope of the area where battles occurred at Antietam is impressive, especially after we visited Bull Run in the afternoon where the fighting was in such a small area for the first battle in 1861. Ohio boys fought at Antietam with the 7th Ohio Volunteers reduced in half. Many of them died in the cornfield, which had been planted on some sections of the battlefield. It was hard not to image ghosts walking among the stalks. At the Gettysburg battlefield we visited Culp’s Hill, and found markers for the 7th Ohio Volunteer Infantry and 29th Ohio Volunteer Infantry near the Pennsylvania boys. They were ordered to Little Round Top but got lost and missed some of the deadliest fighting. We attended the Gettysbu rg reenactment and I learned about photography, Mrs. Robert E. Lee, and the making of the movie, Gettysburg, from one of the actors in it. As the Confederate troops marched out of the woods and lined up for the last time, stacking their guns and relinquishing their haversacks, cartridge cases and military issued equipment, General Robert E. Lee surrendered the Army of Northern Virginia. 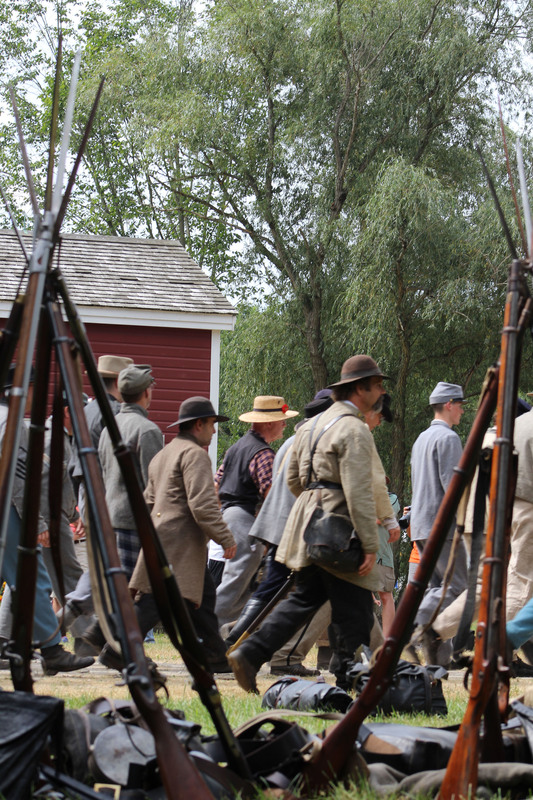 Every August reenactors converge on Hale Farm and Village in Bath to bring history to life. This year, 150 years after the surrender on April 9, 1865, the Confederate troops lost the battle around Appomattox Court House portrayed on Aug. 9. The Rebel flag was rolled up and placed across stacks of guns, surrendered along with piles of supplies used by the soldiers. The regiments were called forward and men of the Southern states received their pardons, some tucking them in their caps. The Union troops, assembled on the perimeter, gave no cheers of victory, and the crowd was unusually quiet as the troops, now civilians, walked away in silence to return home. On Aug. 8 reenactors portrayed the Battle of Dinwiddie Courthouse and the Battle of Five Forks, Virginia. 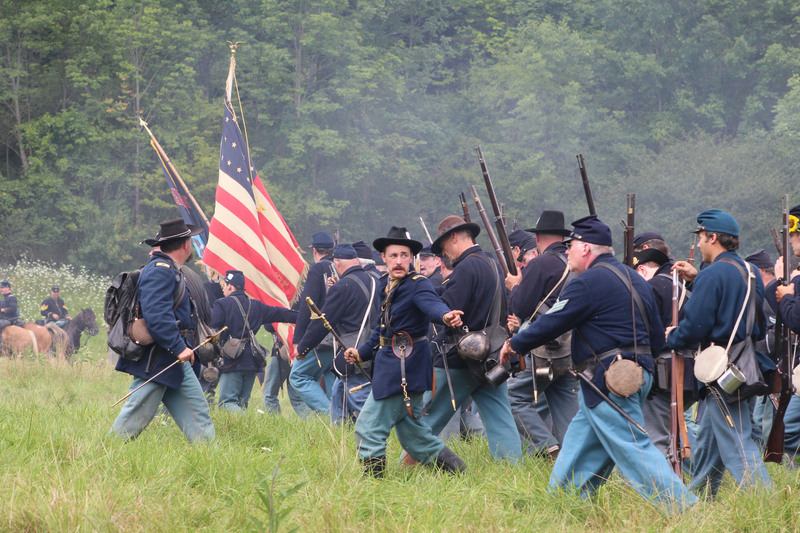 Besides the infantry battles and surrender, the annual event offers artillery demonstrations and cavalry demonstrations with reenactors camped on the grounds. 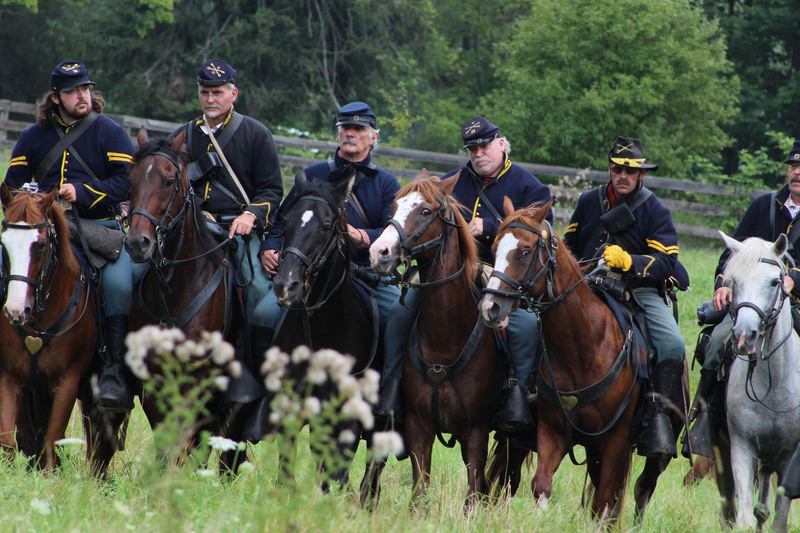 The command staff for the reenactment included Brigadier General Bob Minton, commander of the First Federal Division; Colonel Paul Baltzer, commanding one of the Division’s two infantry battalions; Colonel Nick Medich, commanding the Medich battalion; Captain Greg Van Wey, second in command of Medich’s battalion; and Captain Michael Church who led the 6th Ohio Volunteer Cavalry. The Confederate Camp was in the woods and west side of Hale house. The Union troops were camped on the east side of the road on the green surrounded by historic buildings and the church. Camp Chase Fifes and Drums Corp entertained visitors with music from the Civil War, and President Abraham Lincoln, portrayed by Gerald Payne, gave a speech near the apple orchard. Visitors could learn about photography during the Civil War from Michael Rhodes of Medina and Drew Tanner of Marietta or have their photograph taken on a tintype. In addition to the regular staff at Hale Farm and Village, visitors could ask questions of the reenactors on a variety of historic subjects. Hale Farm was founded by Jonathan Hale in 1810 and three generations lived on the farm. In 1956 the property was bequeathed to the Western Reserve Historical Society. Excerpt from “Impending Love and War” with Cory Beecher explaining courtship to mathematics instructor Douglas Raymond. 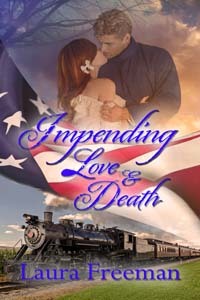 My novels are on sale through The Wild Rose Press at www.thewildrosepress.com and http://goo.gl/CFQBd1 “Impending Love and Death” is due out soon. If Cory had a plan, it disappeared the minute she saw Douglas looking so vulnerable. Maybe it was the sunburn on his high forehead or the way he kept spinning his mangled hat around with his fingertips. She didn’t like hurting others, but it was cruel to lead Douglas on with no hope of loving him. A quick severance was better than letting plans unravel over time. Douglas sat next to her and took her hand. It was sweaty. Cory opened her fan and waved it with her free hand. Cory had meant to gently coax his attention toward Beth, but a harsher voice would be necessary. She glanced around and saw only a few people nearby who might witness the scene she would create. She took a deep breath and launched her attack. “Is that it?” She snatched her hand from his. “Without a declaration of love?” She stood. “Get up! You didn’t even say I was pretty. When other men have proposed to me, they at least compliment me. You didn’t even do that.” She fanned herself with quick, agitated strokes. Douglas thought on her words. Cory was growing impatient. What did she have to do to convince the man to court Beth? Good Lord. She was caught by her own words. She had given him hope instead of making it clear she had no interest in him. “I said no because I’m in love with another,” she confessed honestly. “But he spent the entire evening paying attention to Beth,” Douglas recalled. “You can’t do that!” Cory shouted. “All you have to do is ask,” she prodded. Hudson — Twinsburg won’t be the only place to see double during Twins Day Festivities when twin sisters debut their children’s novels at The Learned Owl Book Shop, their favorite store when growing up in Hudson. Suzanne (Young) Cordatos and Sonja (Young) Anderson, graduates from Hudson High School in 1981, will have their novels for ages 7-12 on sale and be present to sign them on Friday, Aug. 7 from 1 to 3 p.m. at The Learned Owl, 204 N. Main St. in Hudson. They also are registered for Twins Day Aug. 7-9 and plan to be in the parade. Cordatos’ novel, “Lost Crown of Apollo,” features a Greek American family on a boating adventure in the Greek Islands. Eleven-year-old Elias and his younger sister get more adventure than they bargained for when they become stranded on a barren island with nothing but headless statues, lizards, a grumpy caretaker and some antiquity thieves for company. Can a self-proclaimed “bad luck magnet” save the sun god’s priceless good luck charm he’s found–and his kidnapped sister–from the thieves? Anderson’s novel, “Sophie’s Quest,” features an unlikely friendship between a Great Horned Owl and a tiny pirate-wannabe mouse while on a Holy Land Quest. Can Sophie face her greatest fears to save her new friend–something she used to consider “just a tasty snack”? In this book, children will become better neighbors in our diverse world as they gain a basic understanding of the world’s major religions, along with a hint at what makes Jesus so unique, Anderson said. Both books are Mediterranean Sea adventure tales, and both are published by Sunberry Books, an imprint of Sunpenny Publishing Group in the United Kingdom. However, when the publisher at Sunpenny requested full manuscripts–on the very same day–she didn’t have any idea that Cordatos and Anderson were even related, much less twins. Anderson holds a master’s degree in Education from Harvard and Cordatos has a master’s degree in International Studies from Ohio University. They have shared adventures living and teaching together in Tokyo, Japan, but currently “bookend” the USA, with Anderson residing in Seattle and Cordatos in Connecticut. Anderson said her book took nearly 15 years to research, write, revise and submit to publishers. The idea for the story came from teaching a multi-faith religion class in Tokyo 25 years ago, Anderson said. Children need examples of friendship that defy the odds, like the friendship between natural enemies, Sophie and Timley, she said. They also are surprisingly interested in topics like world religion that are rarely addressed in elementary school. Sophie’s Quest offers children a respectful and fun way to learn something about our diverse world, and to introduce them to Jesus in a fresh and exciting way. When Anderson began writing “Sophie’s Quest,” she sent new chapters to her twin sister and suggested she write her own stories. Cordatos indeed wrote “The Lost Crown of Apollo” as a picture book but after attending a conference, an editor suggested a novel to enlarge the Greek island setting. After reading and critiquing her sister’s book, Cordatos said the realized how much she loved creative writing and wanted to share the wonders of Greece with others. In “The Lost Crown of Apollo” readers will get a taste of Greece’s fascinating long past and mythology, it’s beautiful island culture, boating fun, delicious Greek food and warm hospitable people, Cordatos said. Cordatos is working on a book about twin princesses who each have two wishes. Her first picture book, SNEEZE-FIRE from 4RV Publishing will be released soon and is the first in a series about a young dragon facing tough choices. Anderson is working on the sequels to “Sophie’s Quest” and a young adult novel about Christian persecution in 17th century Japan.